One challenge for biologists is estimating how many individuals of a specific species can be found in a given area. There are a number of indirect ways to do this, but many are extremely time-consuming and require capturing and marking individuals. Fortunately, there are some animals whose natural history makes them particularly amenable to estimating population size. 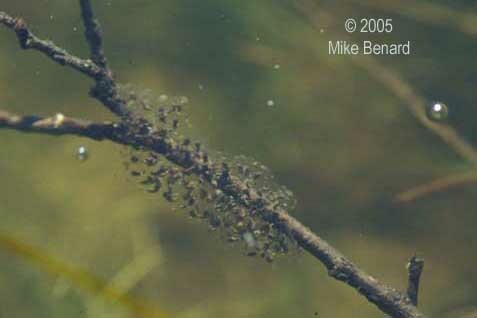 Many amphibians lay clusters of eggs; by counting the number of egg clusters, biologists can often indirectly estimate abundance. The image to the left shows the eggs of two species of salamanders. The bottom egg mass was laid by a spotted salamander (Ambystoma maculatum), while the upper egg mass was laid by a blue-spotted salamander (Ambystoma laterale). Each female will lay multiple egg masses, so counting egg masses does not directly estimate the number of females that bred in a pond. However, counting egg masses can provide estimates of relative abundance, and this information can be important for monitoring amphibian popualtions. For instance, Robert Brodman (2002. The Ohio Journal of Science. 102(5):123-127) estimated the abundance of spotted and Jefferson’s salamanders for over a decade at two ponds in the Cuyahoga Valley National Park, and was able to show that neither species was declining over the course of the study. Another example of an amphibian laying distinct egg masses is the California Newt (Taricha torosa). Each of the little round balls in the photo below contains around 30 individual embryos. Like the Ambystoma salamanders, female newts lay multiple balls of eggs, so counting the balls of eggs doesn’t give an accurate count of how many females bred in a site. Pacific chorus frogs (Pseudacris regilla) also lay clutches of multiple eggs, with each clutch containing anywhere from half a dozen eggs, to over 80. As with the salamanders described above, a single female pacific chorus frog may lay multiple clutches of eggs during a single season. In contrast to many other amphibians, wood frogs (Rana sylvatica) have a few unique characteristics of their breeding biology that allows the number of adults to be estimated in a highly accurate fashion. One such characteristic is that they aggregate in tight groups during the breeding season. Even in very large wetlands, adult wood frogs gather together in one or a few spots. These leks may have hundreds or even thousands of male wood frogs calling in an area only a few meters across. The photos to the right and below show one of these aggregations. Take a close look at the image below…. 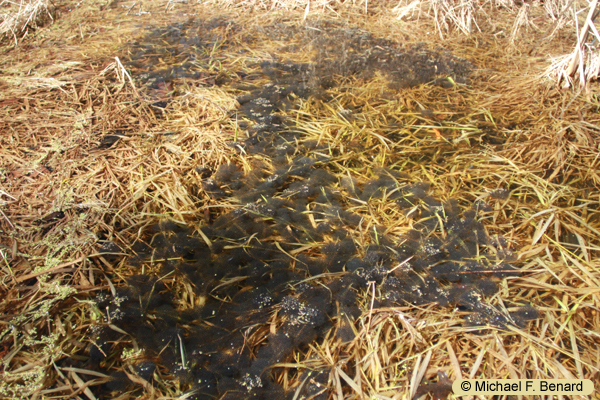 see all the adult wood frogs floating on the surface? Slide your cursor over the image and the individual frogs will be highlighted. Because wood frogs aggregate, nearly all the eggs are laid in a very small area. This makes it easy to find all the egg masses. However, if wood frogs were like other amphibians, in which females lay multiple separate clutches, our estimate of the number of breeding females would still not be very accurate. Fortunately, wood frogs have another important characteristic of their breeding biology: in most cases, each female wood frog lays a single distinct egg mass. Thus, by counting egg masses, biologists can accurately estimate the number of female wood frogs that laid eggs in a pond. A great paper by Crouch and Paton (2000. Using Egg-Mass Counts to Monitor Wood Frog Populations. Wildlife Society Bulletin 28: 895-901) demonstrated the accuracy of this method. The photo below shows an example. Move your cursor over the image to highlight the individual egg masses. This entry was posted in Natural History, Science and tagged Frog, Mating, methods, Salamander, Science, wood frog. Bookmark the permalink.